The winter solstice is long past, and we've survived Blue Monday. Spring is only 56 days away!! Okay, we know it'll be longer than that until spring really appears, but after a much-too-early start to winter, I'm hoping spring will arrive earlier than usual too... a girl can hope, right?! As my perennial beds slumber away under their warm thick quilt of snow, I am dreaming of the blossoms to come. Until then, I'll make my own blossoms in my studio. It's the next best thing! 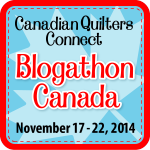 I'm so happy today to be a "detour" on the Island Batik Getaway Blog Hop. If you're visiting here for the first time, as part of the hop, welcome! 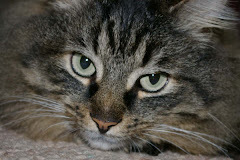 (I hope you'll linger a bit and have a look around.) If you have no idea what I'm talking about, read on. Island Batik is a manufacturer, importer and distributor of cotton and rayon batik fabrics and hand-printed cottons from Indonesia. (You can read more about the company here.) 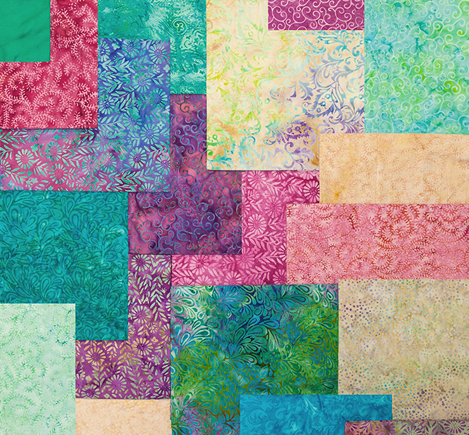 A number of very talented quilters act as ambassadors for Island Batik - several times a year they receive the new collections of IB fabrics to work with, and each month they show the projects they have created, on their blogs. 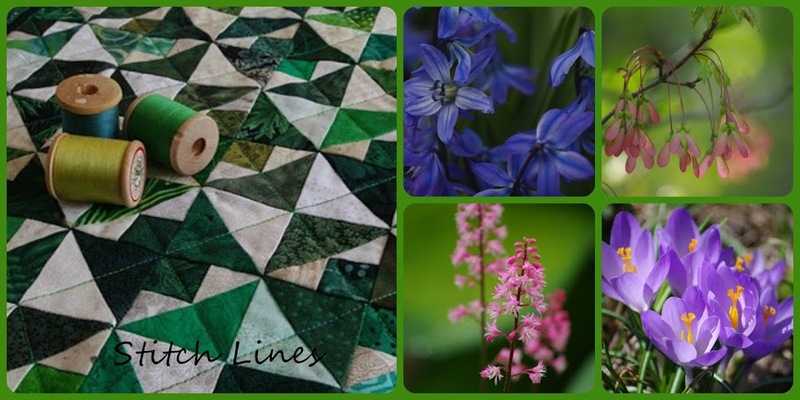 Twice a year (January and August), there is a blog hop to showcase all these beautiful fabrics and the creations that have been made by the ambassadors. The Island Batik Getaway Blog Hop runs from January 7- February 2. You can read more about it here and see the list of all the participating ambassadors. Be sure to visit each one (yes you can still go back and see all those who have already posted in the first two weeks, it's now into week 3.) Best of all, there are some giveaways so be sure to leave comments to enter! This is the Blossom collection. To be very clear, I am NOT an Island Batik ambassador, but my friend Karen at Sew Karen-ly Created IS! Last fall, I asked her what she did with all her leftover batik scraps... "You DON'T throw them OUT, do you?!" I said, with a degree of horror in my voice... (I cannot understand how anyone could throw out their scraps of such beautiful fabrics, although I know many quilters do... ahem..I may have been known to rescue said beautiful scraps from waste baskets after workshops.) My question no doubt led to Karen asking me several months later if I'd be interested in receiving her scraps from the collection Blossom, which was her assigned fabric collection for this Hop. You see, Karen knows my passion is making miniatures. She told me her plan was to use up as much of the collection as she could, but I was welcome to whatever leftover scraps there were if I wanted to make a miniature from them, and show it on her day of the hop, so that's how this came about. You know I said YES! The wheels were beginning to turn... Karen told me she was going to do something with the hexagon shape and that the collection was called Blossom. 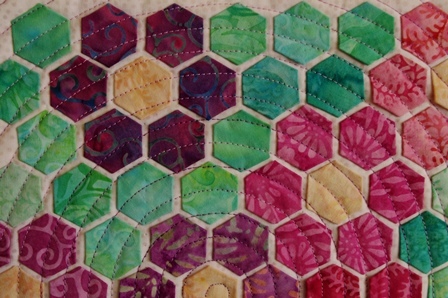 I quickly decided I too would do hexies, not with EPP, but the "modern hexagon" approach. (If that sounds like Greek to you, you can visit a previous post here for an explanation of modern hexagons and how they're done.) Karen is always on the ball, and had a good deal of her piecing done before Christmas so she sent me some scraps in early December. She did send me a few partial shots of her design/partly-put-together quilt which helped with those slowly turning wheels, but I didn't reveal to her what I was planning. Masking tape and a ruler's edge keep it all straight. Then Christmas consumed all my "free time" (Ha! What woman has free time in December?!) and I didn't get going on this until early January. 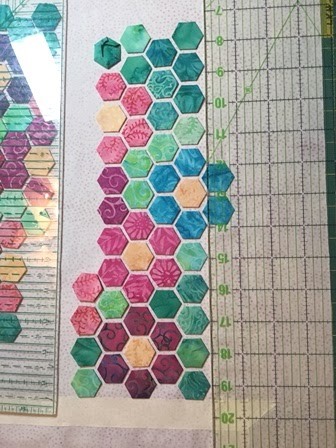 Still with no concrete plan on paper, I set about making little 1/2" hexies. I made about 175, and then started playing with a design. At this point, Karen still had no idea what I was planning, other than using up her scraps. Once I had it pretty well laid out, I asked for more purples and the yellow for centres. Canada Post came through and I had her envelope in a few days (last week.) We do not live in the same province; we're only about 3 hours apart, but neither of us had time to simply "pop by." Finally she sent me a few quick shots of parts of her quilt and I revealed to her my rough design, laid out on my cutting board (photo above.) But she has not seen the end result- she will see the finished quilted miniature this morning for the first time. I can't wait for her response! So... here it is. I'm calling it "Winter Blossom." It is 12.5" square. Without a good straight-on shot of her quilt, I tried to do a representation of hers- not identical, as I did not receive scraps of all the fabrics, and had very limited amounts of most. I thought, when I saw her photos, that she had several blossoms "falling off the edge" so I did the same. Turns out I was wrong about hers, but although it caused me a little grief in the finishing, I'm glad I did it this way... adds a bit more interest I think. My spiral lines, quilted with the walking foot are 3/8" apart. I googled spiral images and found a clockwise Archimedean spiral which printed out to 1/2" spacing. I wanted 3/8" (the distance from the edge of my walking foot to my centred needle) so I printed it at 75% and it came out just perfect. Whew! I traced the first few rounds of the spiral on white tissue paper, pinned it onto the quilt and stitched through the tissue paper, then just continued keeping the edge of the walking foot along the previous stitching. Spirals are not hard, but the beginning must be done slowly and carefully to keep the curve smooth. You may be able to see I used a shorter stitch length at the beginning of the spiral. I chose to face rather than bind the piece. This was my first time doing a quilt facing! Of course the two "irregular sides" made me stop and think "how do I do this?" I made a prototype first to be sure what seemed so straightforward in my mind would actually work. (It did! :)) Nothing like giving yourself a little extra challenge when you're down to the wire! All stitching was done on my home machine, a Bernina 1260 Quilters Edition. Thanks so much for stopping by today, I hope you have enjoyed reading about my little miniature adventure with Karen. I'd love for you to leave me a comment below and tell me where you're visiting from. EDIT: Check out this post to see the final addition to this Winter Blossom quilt. Now you must continue hopping along to the next blog in line and that's Leanne at Devoted Quilter. She also used the Blossom collection. If you wish to "hop backwards" to visit other ambassadors' Blog Hop posts, you can find the complete list with links here. Have fun! I am also linking to Linky Tuesday at Freemotion by the River. This is so beautiful, and from scraps, anyone would think it was all planned to the fabric. Love the spiral quilting, I did hop to you, and will hop on again. That's so pretty......well done, Linda! I am a bit speechless. Your quilt is so tiny, and so perfect, everything in proper scale. 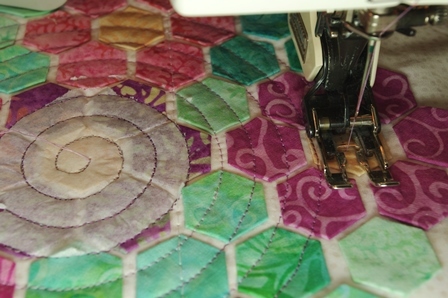 I love the way the blossoms trail off the edge, and the spiral quilting! Thanks for being such a good sport and joining in the fun. For the record, I never throw out the scraps...but sometimes they languish here in the bottom of a box. It's delightful to see them used in such an enchanting way. So beautiful! I love what you did with such tiny 'scraps'. I've never tried a miniature quilt, but you make me want to! Be still my scrappy heart! Just the cutest little quilt. 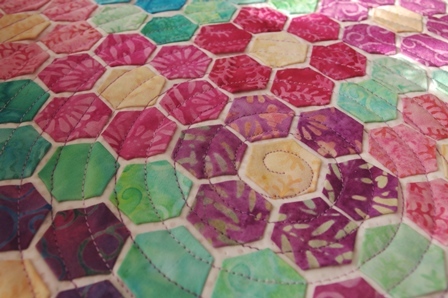 And that spiral quilting is awesome! 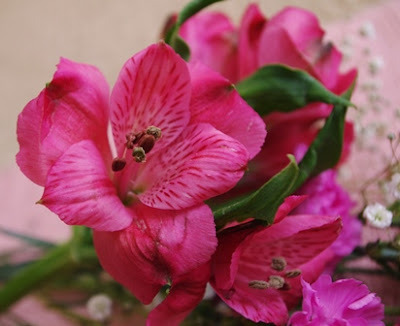 Hi Linda, Loved seeing the sequence and method of making your gorgeous batik floral miniature.. Who would have thought that you and your friend being many miles apart working on each of your projects would flow as if you were side by side.. I love it!! I love simply EVERYTHING about this - the background story, your approach, the techniques (love the facing) and super love the falling off the edge blocks, and the quilting - WELL I don't think I'd do anything different, for sure. You keep raising the bar! 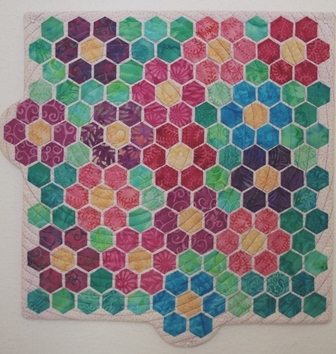 I am from Saskatchewan and I really enjoyed learning about Modern Hexies. You have inspired me to try my walking foot for spiral quilting. Thanks for sharing your miniature quilt. Wow...those are tiny hexies. Great piece. That is so cute and tiny, and I love the colours. Absolutely lovely Linda! The two quilts compliment each other so well. Your work is always so beautiful and I love the cheery, springy look. Joining you in a prayer and a hope for an early spring since winter arrived nearly eight weeks early. Love those little bumps off the edge! Linda your miniature is awesome , a wonderful creative way to use Karen's scraps! That is amazing. Really beautiful and the spiral quilting sets it off perfectly. Love the bumpy edges. That's gorgeous, and so pretty in Blossom. I'm an Island Batik Ambassador from Franklin Square, NY. Great job. Your miniature is wonderful!! 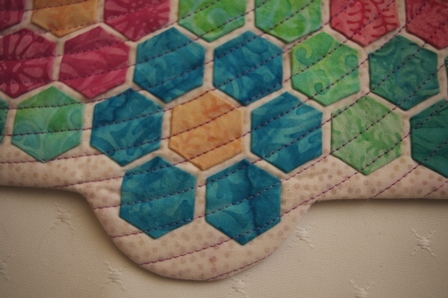 How did you hold the edges of your hexies down? I would like to give this method of using hexies a try and don't want to have to hand stitch the hexies and I think that using fusible on the edges would be too fiddly for me to have the patience to actually do!! 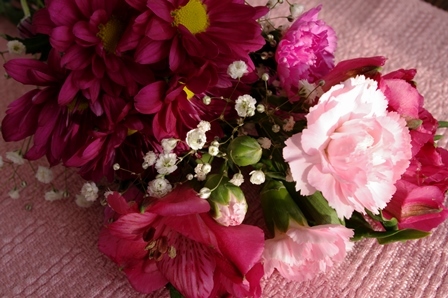 Your two posies that "fall off" the quilt absolutely make the quilt totally special!!! So glad you took the scraps and made a beauty!!! Your quilt is gorgeous. I’m from Ocala, Florida. Wow! So tiny. I love miniatures. Thanks for treating us to this fun detour. I loved seeing your creation via this “detour”. I’ve recently taken a liking to working with little pieces (lol)! I live in Woodstock (Ontario). I just love your piece Linda! 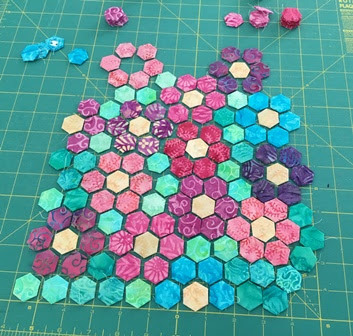 Wow those are TINY hexies...I checked out your previous post on how you do it the modern way...might just try these again. Susan Earle, Kathy Feltmate and any others who are "No Reply commenters".. I hope you check back here to see this. I cannot reply to you personally as you are a No Reply commenter. Unless I know you personally and have your email address, I cannot get back to you. You need to attach your email address to your profile. If you are on Google Plus,ONLY others who are on Google Plus (and I am not) can access your email address. 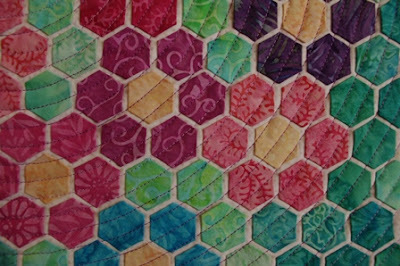 If you go to Bonnie Hunter's blog at quiltville.blogspot.com and at the top, click on BLOG HELPS! you will find a good explanation of how to fix this! Wow, I love that you made a piece that coordinates with Karen's! So many tiny hexagons! This is lovely, and I like the blossoms that fall off the edge. You asked where each reader is from: Charlotte, North Carolina. The fabric is beautiful. 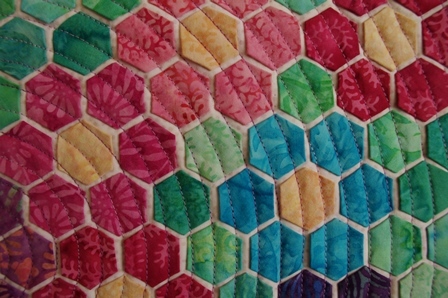 Hexies and spiral quilting is pure perfection. Wow! Your quilt is amazing . I can't imagine working with sipuch small pieces. Thank you for sharing your quilt with us. I am from Maryland, USA. This was a very fun detour, thank you! 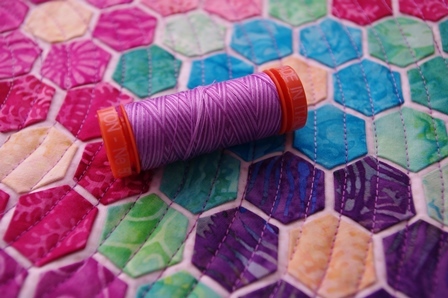 Love your little quilt, and really enjoyed reading about your process. Island Batik ambassador visiting from Australia. Thanks Dione! This little quilt was great fun. You are a No-Reply commenter so I cannot reply personally. Thanks for stopping by, all the way from Oz! I hope you'll visit again. Wow your work is beautiful! You should be an Island Batik Ambassador! The beautiful fabrics make me yearn for spring! Thanks for sharing. Wow, stunning work. I'm hand piecing flowers and stitching them the traditional way. Love what you've done here. I love everything about this miniature. Can't believe it was only 12.5 inches. Thanks for the inspiration. Linda, it's beautiful. I can't wait to see it in person. Love your Valentines header! Stay warm. That’s beautiful! I haven’t seen the hexies laid out like flowers before. Well done for being original.